Break off a nub, small enough to fit in the palm of your hand, and buy it. When you get it home, peel the skin off the ginger. It’s tricky to get around the little nubs, so you may have to cut some spots off with a knife. 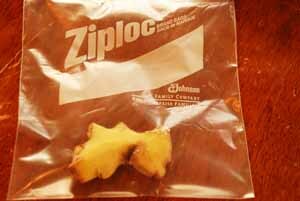 Store it in a ziplock bag, and throw it in the freezer. The next time you need a teaspoon of ginger, pull out the frozen ginger, and using a cheese grater, grate the ginger you need. Frozen ginger is easier to grate, and your cookies will notice the difference. I did not know that ginger contained antibiotic properties. I enjoyed these tips. it is also good for anti-inflammatory purposes, too. The way to freeze it… thanks. You don’t even have to peel it – just grating it straight out of the freezer works just as well :).